FavorPrep™ Tri-RNAReagent is a reagent from the improved phenol and guanidine isothiocyanate (GSN) method for the single-step RNA isolation. 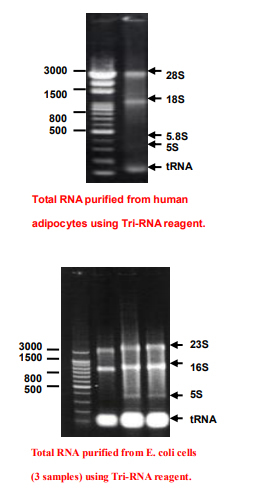 During sample homogenization or lysis, Tri-RNA reagent maintains the integrity of the RNA, while disrupting cells and dissolving cell components. The composition of Tri-RNA reagent includes phenol and GSN in a mono-phase solution. A biological sample is homogenized or lysed in Tri-RNA reagent and homogenate is separated into the aqueous and organic phases by chloroform addition, vortexing,a nd centrifugation. RNA remains exclusively in the aqueous phase (clear upper phase), DNA in the interphase, and proteins remain in the organic phase (red color). RNA is precipitated from aqueous phase by addition of isopropanol and solubilized/concentrated. If needed, DNA and proteins can be sequentially precipitated from the interphase and organic phase with ethanol and isopropanol respectively, and solubilized/concentrated. ★ The entire procedure for total RNA isolation is less than 1 hour. 2. Homogenize tissue samples in Tri-RNA Reagent using a glass-Teflon or Polytron homogenizer (cultured cells can be lysed by repetitive pipetting; concentrated blood RNA viruses can be lysed by vigorous vortexing). 3. Leave the homogenates for 5 minutes at room temperature. 4. Add 0.2 ml of chloroform (not provided) and mix vigorously. 5. Centrifuge at 12,000 rpm for 3 minutes to separate the phases, RNA is in the clear upper aqueous phase. 6. Transfer the RNA phase to a clean tube. 7. RNA is precipitated by adding 1x volume of isopropanol, vortex, leave at room temperature for 10 minutes, and then centrifuge at 12,000 rpm for 15 minutes. 9. Wash the RNA pellet with 0.5 ml ice cold 70% ethanol, centrifuge at 12,000 rpm for 1 minute, and carefully remove the supernatant. 10. A brief spin to make sure the RNA pellet is precipitated to the designated side wall of the tube and then carefully remove any residue supernatant without touching the RNA pellet.